Fiordland is the largest National Park in New Zealand, and one of the worlds largest in fact, but it is also one of the most remote & inaccessible. It is situated in the wild Southwest corner of the South Island. The large town of Te Anau provides the major gateway to the Park. Te Anau is approachable from Queenstown and Wanaka in the north, and Invergargil in the south on major highways. Milford Sound is the most visited "town" in the Park, being situated within its northern boundary, and accessible by road (120km) from Te Anau. Fiordland is grand! It is very remote, extremely rugged, so much so that many inner areas of the Park remain virtually unexplored even today. Fiordland gives you dense green forest, exquisite lakes, glacier-gouged passes with impossibly steep sides, and the highest rainfall of anywhere in New Zealand. It is this extreme rainfall which gives rise to thousands of waterfalls which plunge down every conceivable cliff or crevasse. The Park houses the worlds second largest waterfall and New Zealands tallest, Sutherland Falls, which plunge 580 metres. These can be seen as a side trip on the world famous Milford Track (a 53 kilometre walk through the heart of Fiordland. Fiordland is home to New Zealand's most rare bird, the almost flightless Kakapo, a large yellowish green parrot, that like the Parks Kiwis is nocturnal, and spends most of its life ground-bound. Fiordland contains caves on beautiful Lake Te Anau. Sea life abounds in all its hidden coves and bays, or Sounds (seals, penguins, dolphins). Short walks are many in Fiordland National Park. There are lots just around Te Anau, however more are found on any road system that touches on the Park. Ask at the Visitor Information Centre in Te Anau. Some suggestions include the 6hr return trip to Mt Luxmore Hut on the Kepler Track, Brod Bay Nature Walk, Control Gates to Rainbow Reach. Around Lake Manapouri try the Pearl Harbour Circle Track, or at Milford Sound walk around to the Bowen Falls. A trampers paradise! Most of New Zealands world renowned walks either are in this Park, or at least start on the Main Divide on its boundary. The Milford Track is the most accessible, and civilised of the walks, it takes 3-4 days and travels through magnificent scenery. The Routeburn Track starts on the Main Divide, working its way over spectacular rugged mountains to finish near Glenorchy in Aspiring National Park. Both of these walks are "Great Walks", therefore you must book your presence on them in advance. The Greenstone & Cables Valleys provide alternative routes back towards Queenstown from the Main Divide. 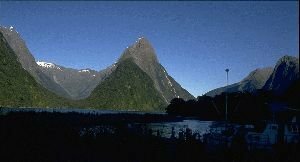 A classic hard tramp of 8-10days is the Dusky Sound Track, this visits Fiordlands most remote corner. The rewards for your effort is solitude, excellent scenery, adventurous routes, and finally the tranquil head of Dusky Sound itself. Experienced Trampers Only! The three main centres of accommodation are at Te Anau, Manapouri and Milford. All provide for most styles of accommodation, and something can be found to suit most budgets. At Manapouri & Milford it is advisable to book ahead especially December through to April. If you are at Te Anau, everything you need is there, as soon as you move into the Park, there is a dramatic dive in available facilties. Assume Banking & Grocercies can only be obtained in Te Anau.